The North American Commercial Roofing market is currently estimated at $4.5 billion and growing steadily (3-5% annually). 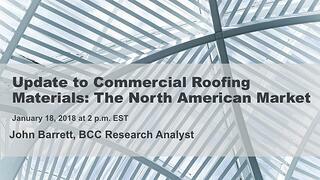 In a member-exclusive webinar on January 18, 2018, BCC Research analyst John Barrett gave an update to the June 2017 report Commercial Roofing Materials: The North American Market where he overviewed the market and described the most important factors impacting growth across the continent. According to Barrett, the market in North America is largely dominated by replacement roofs, which constitutes over 90 percent of the market (94% of volume and 91% of the value) as the inventory of existing buildings continues to age and the need for replacing roofs continues to grow. There are a very wide variety of product segments, ranging from polymer composites, similar to a shingle and makes up a very small portion of the market, to hot BUR (built up roofs)—the largest segment, valued at almost $700 million. The six largest product segments represent over 65% of the category value and 70% of the volume. “When we look at how these products are distributed, most of it is sold direct from the manufacturer to the contractor or building owner,” said John Barrett, BCC Research analyst. He added that other forms of distribution, one-step, two-step and through lumber yards, account for just over 50% of the market. As for the manufacturers, they tend to be concentrated. “The top producers tend to control the 'lion’s share' of the products,” he said. What is shaping the future of the industry? Extreme weather and more powerful storms are expected to drive demand for roofing and could also disrupt the supply chain, having a substantial impact on the commercial roofing market. Labor shortages are expected in the coming years, which could impact the industry on several dimensions; finding quality workers, an aging workforce, prefab solutions displacing the need for labor as well as language barriers within the workforce. Sustainability is profoundly impacting the commercial roofing market and affecting new product development. The popularity of LEED architectural guidelines has led to the international green construction code and other rating systems, which is turning into a long-term trend. While the North America commercial roofing is slow to adopt new products, sustainable products are expected to enter the market more quickly. “The new product activity that does happen will focus on green and sustainability, things like lowering the VOCs in roofing products, a greater focus on reflectivity, but also things like the distance that the product moves, and other aspects of sustainability that companies and increasingly building owners will be concerned with,” Barrett said. Other technology developments—dubbed process technologies—are expected to outpace product developments in the future, simplifying and improving installation and maintenance through more integrated systems. Furthermore, drones have the potential to impact commercial roofing. Drones can be used to take these infrared scans and monitor for damage; however, they could also impact labor. Drones could be used for job estimates, displacing the need for people to actually survey roofs as a remote operator can take the necessary pictures for job estimates. BCC Research Members can access the entire recording here in the Member Library.